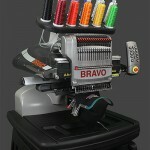 The Amaya Bravo 16-needle embroidery machine creates colorful designs on shirts, hats, pockets, and other cloth goods at up to 1,000 stitches per minute. A range of hoops accommodates small designs up to 14″ x 11″ jacket backs. Pocket and hat attachments are also available. Use this calendar to register for a class. Use this calendar to reserve time on this tool.